I get this error on every frame and it's significantly hampering my fps. I get in in the town of Stirk. Mooncrabs seem to have missing sounds, as well as missing idle animation. I wondered why there was a giant black square on my minimap, so I used TCL and found this. 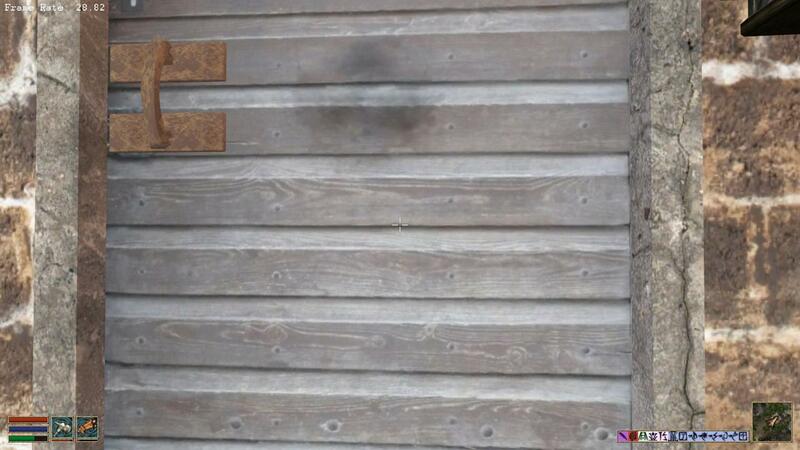 The trap on this door does not trigger when it's opened. Lighthouse door acts strangely, sometimes showing the cell transition destination, sometimes not. Interestingly, the interior version of it does not have this issue. I feel like this stairs should have a collision mesh so I can more smoothly move up. The collision should be in the shape of a slide for the smoothest experience. Another object missing something and hampering FPS. Not sure if it's a bug, but small slaughterfish at Vabrasiel are friendly. Small slaughterfish are always friendly, even in vanilla Morrowind. That's strange. 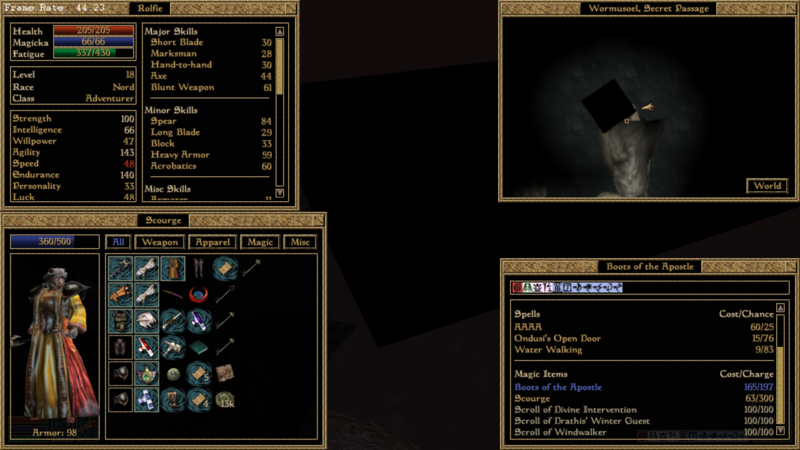 In vanilla Morrowind both slaughterfish and small slaughterfish have 100 fight, 0 flee 0 alarm 0 hello (checked CS). Unless the regular slaughterfish is also friendly, the small one shouldn't be either. I coc'ed to Khuul with only Morrowind.esm, Tribunal.esm and Bloodmoon.esm loaded and immediately got attacked by small slaughterfish. Yeah, disregard that. Seems like there is some kind of ai bug with them? We'll look into it. For the quest 'Atmospheric Dictative' you talk to Procis Popillious in the lighthouse. 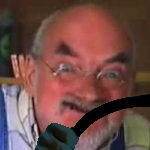 He tells you how to get all the items you need to complete the quest. However, if you ask him how to get the lens, he will not be able to tell you how to get any of the other items. when you ask about the lens, he sends you to get groceries for him, and when you've done that he won't tell you how to get the rest of the items. He just says 'Was the lens any good?'. With regards to the black square. That's not a bug. 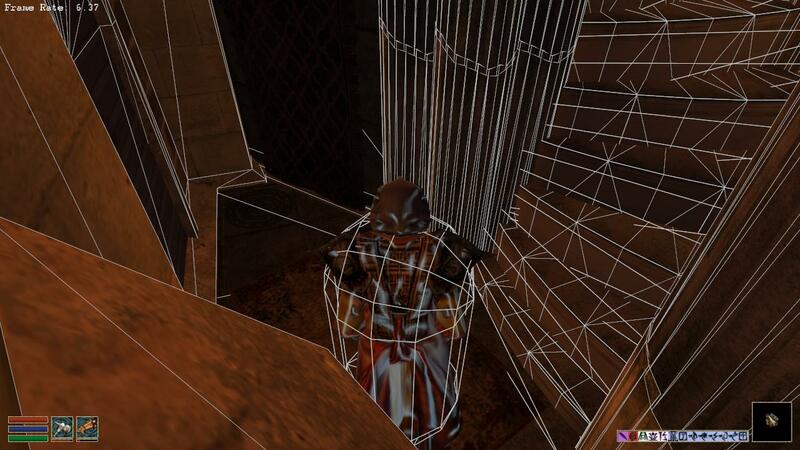 Its a technique used in vanilla morrowind to mask out certain areas on the minimap. Also, have you seen any of these errors in vanilla engine? 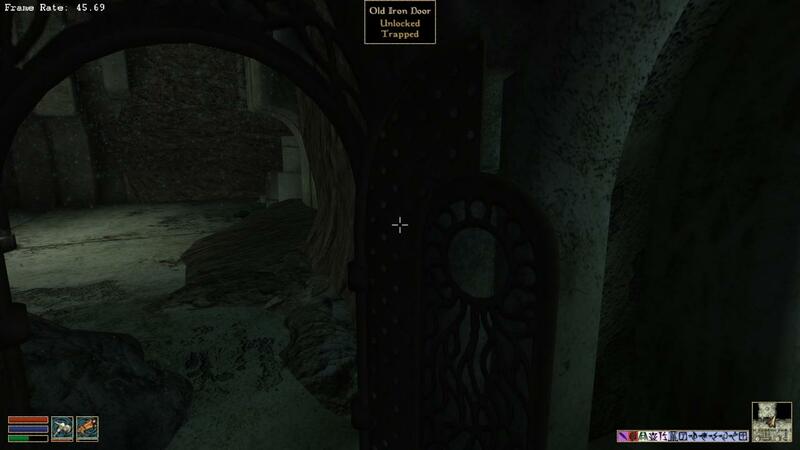 OpenMW isn't exactly bug free. I know some of these issues like the collision are mod related. But its hard to tell at this stage which are caused by OpenMW or the mod. The missing animations bug is an OpenMW bug, but they fixed it in version .43 which sadly isn't out yet. The thing with Vanilla Engine is that when it has an error, it doesn't necessarily tell you. It might be having a hundred internal errors going on inside and not make a single squeak. OpenMW is a bit more local and lets you know when there's an issue. Just because OpenMW tells you there is an error and vanilla engine stays silent does not mean vanilla engine is not getting any errors. 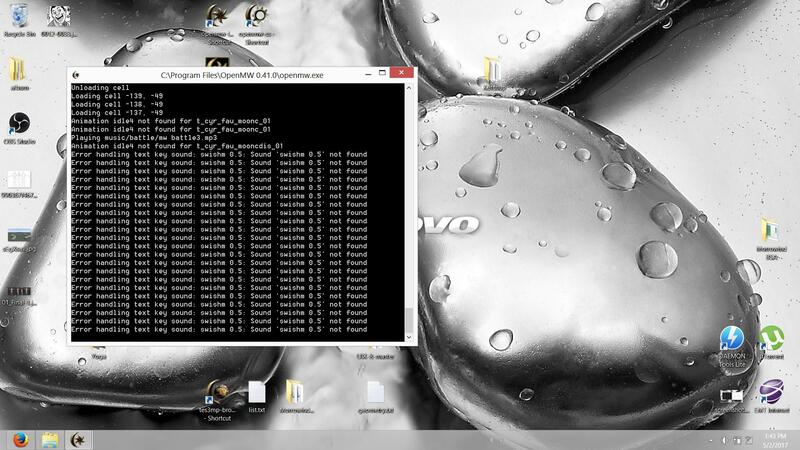 Often it crashes without telling me what error made it crash. 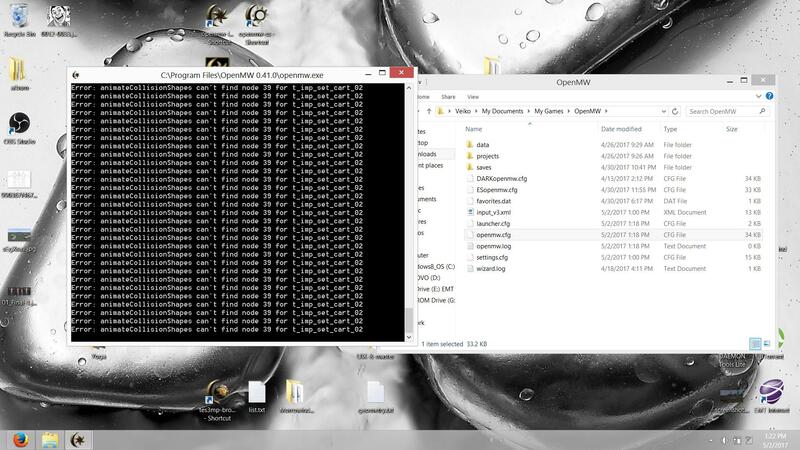 In vanilla MW there is a Warning.txt file in main Morrowind directory (not Data Files, but where the launcher is) that autoupdates itself every time and records everything that's off. Probably it won't record all the bugs, but anything that caused the crash would likely be mentioned by the end of that file; at least from my experience, that is. The quest The Helvor Legacy has you talk to a member of the Archaeology Society for directions to two Colo-Nordic tombs on Stirk. She will tell you their approximate locations dialogue and mark them on your map. However, once you leave the conversation there is no way to get to the information. Your journal doesn't tell you where she said the tombs were and instead says that she marked the locations on your map. They don't appear on the map though, and she won't tell you where they are again if you forgot. The map problem is reproducible for me, but a more detailed journal entry might be an easier fix. Also, is this the spot to put quest related bugs? Please don't include detailed version numbers in the .ESP filename (e.g. "PC_Stirk_v4.8.ESP"); this will cause breakage with any third-party add-on that cites it as a dependency but is actually compatible with later versions. In OpenMW, anyway. OpenMW will just crash on start up with an error message if mod A has mod B as a dependency by name and the filenames don't match. No idea what the Bethesda engine does. Maybe it's okay to use the "01", "02" major release-phase numbers (if that's what those are), if it's expected for stuff to break and have to be rewritten between a major transition. Still, keep in mind that just the transition to Tamriel_Data 3.0, with renaming of various files, broke all old add-on mods for both P:T and TR, necessitating a Java fix-it app. The more of that we avoid, the better. As just one example, I have a Seyda Neen to Stirk travel mod that would probably work, given the simplicity of the task, but which crashes OpenMW because it asks for Cyrodiil.esp instead of the current .ESP file's name. If that changes with every single release, it will greatly discourage creation, maintenance, and use of add-ons for P:C.
T_CyrImp_FurnR_Dw1Empty	Stirk, Helvor Manor	-789	519	-207	"two pieces of clothing are floating"
Few bugs after visiting village Stirk. Door from exterior to "The Magnificent, Upper Level" teleports somewhere to the Ashlands. Definitely not to the ship interior. In C&E Archives bottom floor, on the table there's paper named <Placeholder>. The Praetorium is marked on map in "Strik Histories" book as "Prefecture"
Quests should've some more journal entries. The journal isn't updated after gaining important imformation. For example the apothecary quest doesn't have entries about potential quest items locations gained after talking to townspeople. Selkie quest doesn't have entry after talking to Quintus Troglio. Iskuss already wrote about similar "The Helvor Legacy" problems.